The VR-4HD is a complete HD studio in a compact and portable package that replaces several different pieces of complex A/V equipment. Designed with single-person operation in mind, the VR-4HD enables easy switching and mixing of sound and video using advanced video and audio Digital Signal Processing (DSP) along with dedicated hardware controls faders, buttons and touch screen interface. It beautifully integrates a digital audio mixer, video switcher, multi-viewer touch screen and USB video/audio streaming interface into a stand-alone device. This portable live HD production solution is ideal for schools, churches, council meetings, corporate events, sports, training sessions, or any other live event. 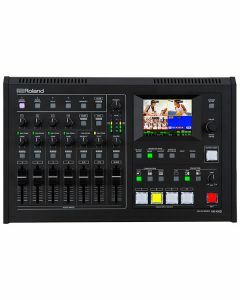 Put switching, audio mixing and USB streaming into a single device and the end result is the Roland VR-4HD HD AV Mixer. Four channels of HD video and eight channels of audio can be seamlessly mixed down with preview and program (main) video outputs. Innovative digital processing eliminates many of a professional A/V setup’s stumbling blocks. User-friendly HDMI, VGA, composite, XLR/TRS and RCA inputs make the VR-4HD compatible with virtually all available video and audio equipment on the current market. The USB output allows the user to capitalise on HD video streaming over the internet using popular streaming platforms, or advanced multi-source videoconferencing, and affords the ability to record straight to your hard drive for distribution. The interface on the VR-4HD provides both tactile controls and a touchscreen for an instinctive and complete control surface where all essential controls are at the operator's fingertips. Physical faders deliver detailed audio adjustment, while the built-in multi-view LCD is a touch interface for editing set-up parameters and adjusting picture-in-picture settings with basic swiping gestures. Across the intuitive interface, varied input options and USB connectivity, the VR-4HD is a multipurpose tool well suited to a number of applications.